Oak Cliff Film Festival for Cyclists! The first annual Oak Cliff Film Festival begins this Thursday! 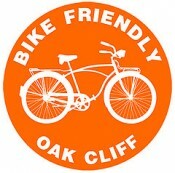 Bike Friendly Oak Cliff has partnered for half-price discount on full-access badges for cyclists who bike to the events (use password f4iend50f0akclifffilmfest to purchase online). This is your pass to all the film screenings and parties throughout the weekend. You can park blocks away and bike up or bike from home, but you make your scouts honor pledge to help relieve parking woes and receive your thank-you gift in advance. Films will show at: Texas Theatre, Kessler Theatre, Bishop Arts Theatre, The Belmont, Oil & Cotton, El Sibil, the Turner House and the Dallas Zoo. See the full line-up here. Saturdy at 11:30 am Bike Friendly Oak Cliff will be hosting a group ride, On the Trail of Lee Harvey Oswald starting at the Grassy Knoll. 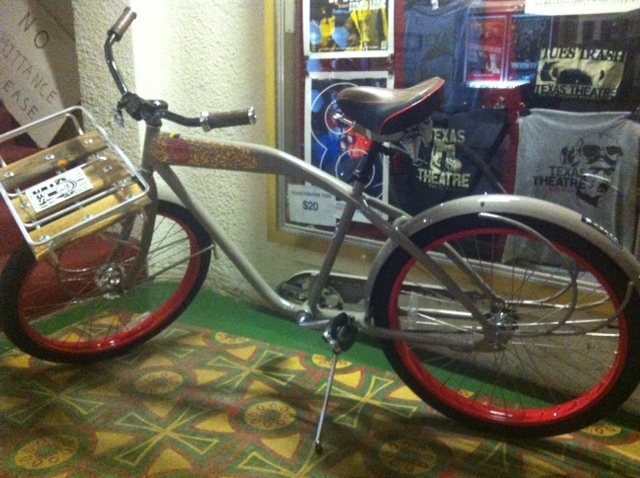 The New Belgium Brewery bike – for raffle. Sunday at 8:30pm The Dallas Zoo will host a screening of Fantastic Mr Fox. All who attend will be entered in the raffle to win the New Belgium BIKE! Yes, their specially designed bicycle (that’s been on display in the Texas Theatre’s lobby) will be raffled off that night!! It’ll be a full weekend of film fun and bicycle love. Get your film festival tickets at oakclifffilmfestival.com or get your cyclist discount badge here (use password f4iend50f0akclifffilmfest.) The Oswald ride, as always, is free and open to all ages. See you there!